A comparison of half-a-dozen scorpion species shown in ultra-slow motion revealed an unsuspected variety of strike modes, they reported in the journal Functional Ecology. The death stalker had the fastest lunge of all, with its venomous stinger snapping over its head like a whip at 130 centimetres (51 inches) per second. It has a no-nonsense trajectory, moving straight towards its target before flicking upward. The emperor scorpion—the world's largest—has a similar open strike. Other species, such as the black spitting scorpion, which can squirt venom at a distance, and various members of the hottentotta genus, strike with a more circular motion, forming an "O". "We found that different 'tail' shapes"—some slim, some fatter—"appear to permit different strike performances," said senior author Arie van der Meijden, a professor at the University of Porto in Portugal. 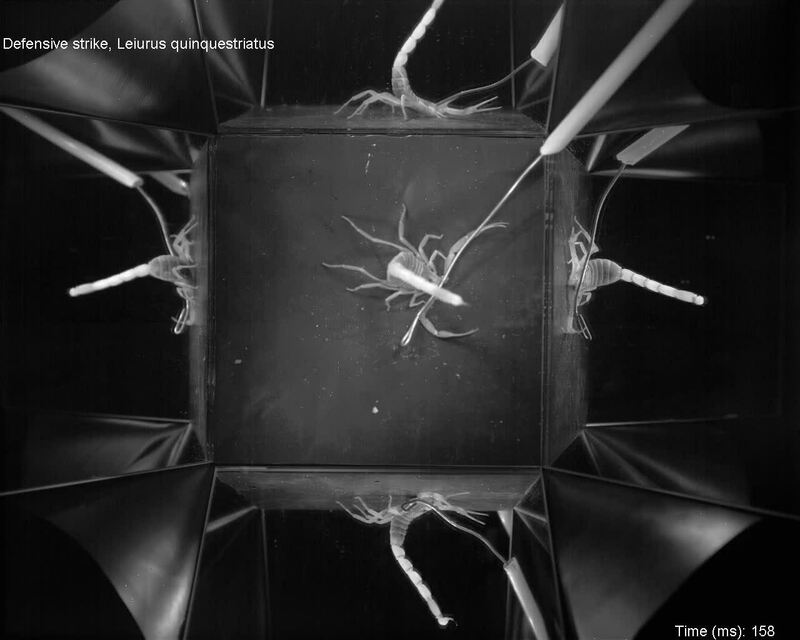 To record and analyse the lightning-fast strikes, van der Meijden and his team built a small platform surrounded by mirrors on all four sides. They filmed the scorpion strikes from above with a video camera at 500 frames per second, and then created 3D models with computers. "Just taking them out of their container and putting them in the arena was enough to get them in stinging mood," van der Meijden said. "All that was necessary to make them strike was touching their pincers with a thin piece of wire." Next on the research agenda is to figure out the evolutionary forces which explain why the strike patterns are so varied. It could be "related to the kind of predators they need to defend themselves against," van der Meijden told AFP. The differences could also arise from the fact that some scorpions rely less on their tail stingers, and more on their pincers to ward off a threat. Scorpions use their defensive arsenal against bats, snakes, lizards and other predators. They also use their stinger to catch prey, and during mating. 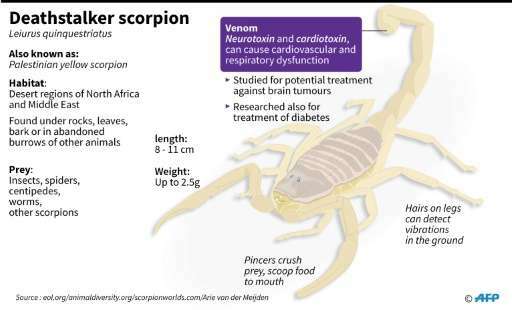 A 2008 study in the journal Acta Tropica estimated that more than 3,000 people die every year from scorpion bites. Measuring up to 110 millimetres (4.3 inches) in length, death stalkers (Leiurus quinquestriatus) are found in dry regions of North Africa and the Middle East, where they live under rocks. Their venom is highly dangerous for adults, and potentially lethal for children, but has been a valuable avenue for drug research.